Packing suits for travel is an art that anyone can master. Regardless of where you are going, on a business trip or a great Caravan Tour, having at least one suit on hand can be useful. The key is to pack the suit or suits in the least amount of space and with the least amount of wrinkles. That takes planning. What Suits Should I Bring? Understand where you are going and what you are going to be doing. This is essential since it will help you decide what you are going to bring. Will you be in a number of different formal situations? Is this a casual family trip? Is it all business? You need to get as much flexibility as you can out of a limited wardrobe. Stay with neutral, conservative colors such as gray or blue. Black would be the choice for formal events. Add variety to your wardrobe with different shirts and ties. There is a school of thought that says you dress for comfort while traveling and pack your suits for use when you are settled. Another school of thought dictates that you should wear your suit on the plane. The theory on that is that you will then have the additional space in your bag for other, more important items and that the suit will be less likely to wrinkle if it is not in the suitcase but rather on your person. The truth is that while it is true that wearing the suit will give you more space in the bag, it will do nothing to stop wrinkles. Time at the airport going through security, and of course the time spent on the airplane itself will see to that. However, there are things you can do to reduce them. How you pack your suit will determine whether or not you arrive with something you can quickly put on and wear out the door. The key to this most difficult art is found in something most of us would rather throw away: Dry cleaning bags. How do perfectly pressed clothes wrinkle in a well-packed suitcase? By rubbing against each other every time the bag is shifted. Consider it. How many times during a trip is your bag moved? It starts on the bed, where you carefully fill it up, and then you close it and pick it up and take it to the door, setting it down again. Then you pick it up again and take it to the car...you see where this is going? You are not out the door yet and the contents have already been shifted five times. Since no bag is packed so tightly that nothing could move, with each shift, everything rubs up against each other, making wrinkles. That is where the plastic comes in. 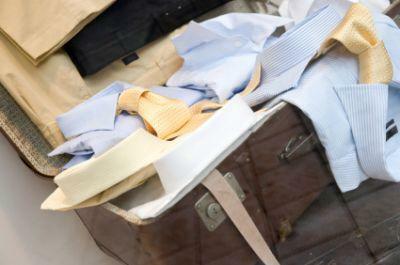 By packing your suits in plastic dry cleaning bags, you will protect them from this relentless friction. It will be plastic sliding on plastic, not wool on wool. Just be sure to avoid the bags with writing on them since the inks used can actually rub off onto any adjacent fabrics. If dry cleaning bags are unavailable, trash bags will do just as well. You will just have to get over the natural aversion to wrapping a thousand-dollar Brooks Brothers suit in a Hefty bag. Now that your favorite gray flannel is properly encased, with more or less the dignity it deserves, where in the bag should it go? Again, opinions differ. There are those who say that the back or bottom of the suitcase is the place to put them and others who hold with placing them at the top so they will be easily accessible when you reach your home or hotel. Place the plastic-wrapped suit jacket in the bag first, centered with the center of the bag. Allow any part that does fit to drape over the sides. Now, fill the case with the rest of your clothes, being careful to minimize the chance that your shoes could create creases in the suit. Once this is done, then fold the excess material of the suit over the rest of the clothing and close the suitcase. The old advice telling you to just pack what you will need for each day of travel is doubly true when you are packing suits for travel. A couple of extra shirts will add a level of variety to your wardrobe, but don't go overboard. You need to take what you need and no more. Overstuffing your suitcase will simply mean more work, muscle aches and sweat for you, and more wrinkles for your clothes. Also, with no extra space in your bag, how will you bring back those all important souvenirs?